It's Like An 'Electric-Fence Sensation,' Says Scientist Who Let An Eel Shock His Arm : The Two-Way A neurobiologist noticed something strange whenever he tried to fish out electric eels in his lab using a net with a metal rim and handle. So he decided to roll up his sleeves and investigate. 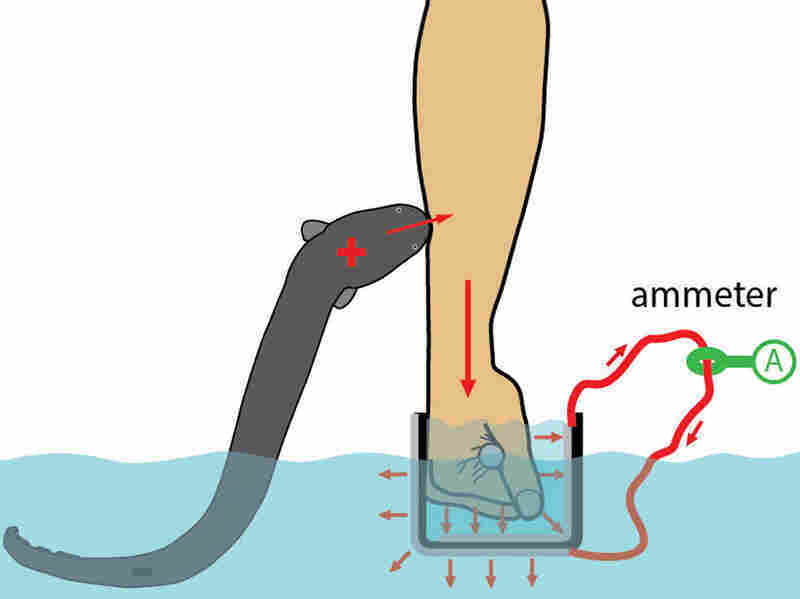 Ken Catania of Vanderbilt University lets a small eel zap his arm as he holds a device he designed to measure the strength of the electric current. Electric eels sometimes leap out of the water to increase the power of their jolt — and one scientist has been trying to understand this behavior more fully by letting a small eel repeatedly shock his arm. Catania says the foot-long eel delivered a current that peaked at around 50 milliamps. Ken Catania, a Vanderbilt University neurobiologist who has been studying electric eels in his lab, recently noticed something strange whenever he tried to fish them out with a net that had a metal rim and handle. The eels would leap out of the water to attack it. "Electric eels, in my experience, had never done something like that where they come out of the water, and they did it in a very directed way," he recalls. What's more, he had electrodes in the water so he could listen to their electrical output through a speaker. "So I knew that when they were attacking the net in this way, they were simultaneously giving off a high voltage discharge," Catania says. "That clue led me to think, 'Well, maybe this is sort of a defensive behavior.' "
He knew that these eels tend to interpret electrical conductors as living things. Maybe the net seemed like a predator coming down from above, and leaping out of the water somehow intensified the eel's ability to shock. He started to explore this possibility by threatening the eels with a metal plate rigged to a device that could register the jolt. "As the eel came up out of the water, the voltage that I recorded increased in proportion to height," Catania says. "The higher they got, the higher the voltage and that suggested why they might be doing this." Catania wanted to see what kind of electric circuit would be created when the eel touched a living animal. So he let a small eel, about a foot long, zap his own arm as he held onto a device he designed to measure the strength of the electric current. "I was not worried about injury, and of course if you work around electric eels a lot, occasionally you're going to get shocked anyway," he says, "so I kind of knew what I was in for. Sort of like an electric-fence sensation a few times." In the journal Current Biology, he says this small eel delivered a current that peaked at around 50 milliamps. But electric eels can grow to 5 feet or longer. "It does allow us now to think about and make some pretty reasonable estimates about, 'Given an eel of size X and water resistance of a known resistance, how much power would one of these eels be able to divert to a human being that was standing in the water?' " Catania explains. If a big one pounced, the shock would be intense, he says, "much more powerful than a law enforcement Taser and coming at a pulse rate that is higher than the pulse rate given off by a law enforcement Taser." One video online appears to show a fisherman being shocked in this way by an eel that emerges out of the water and wiggles up his chest, Catania says, and there is also an old story from famed naturalist Alexander von Humboldt back in the 1800s that described electric eels leaping up to attack horses. For years, no one knew what to make of that historical anecdote, says James Albert, a biologist at the University of Louisiana at Lafayette who studies tropical fishes. "But now, there's some evidence for it, for the first time," Albert says. "This apparently is a natural behavior of the animal in the wild." Exactly how and why electric eels evolved to jump up in this way remains somewhat a mystery. During dry seasons, eels do get stuck in shallow pools of water, Albert says, and one could imagine that predators such as crocodiles or large cats might try to attack. But it seems like one shock would quickly deter them. "I don't know what would go after an electric eel in the wild. Anything that tried it once or twice would soon learn that wasn't a very desirable target," Albert says. He notes that it actually isn't uncommon for fish to leap out of the water to escape underwater predators, but this kind of attack is unusual. Although the electric eel has been a curiosity for centuries, much about its life remains completely unknown. "We don't even know how many species there are," says Albert. "We don't know that much about where they live, how they live. It's a hard fish to study." That is one reason why he is so intrigued by Catania's work. He also admires the scientist's willingness to offer up his own arm. "There's this history in science of scientists willing to take one for the team, so to speak," Albert says. "The people who first worked on electricity, they used their own bodies to show that if you zapped yourself, you could make a muscle contract, you can make your finger twitch, that sort of thing." Bruce Carlson, a biologist who studies electric fish at Washington University in St. Louis, says that Catania's studies over the past few years have revealed a surprising degree of sophistication in the eel's electrical behavior. "Really, I think the community was kind of naïve and just thought that, 'Well, it's really simple, the eel generates up to 600 or 700 volts of electricity and so it just shocks whatever is near it, and it's as simple as that, and there's really nothing to study here,' " Carlson says. "Ken kind of has a knack for observing behavior carefully and seeing things that other people haven't thought of before and then designing really elegant studies to dissect those behaviors in more detail." He says the eel's leaping behavior is so robust, predictable and effective at delivering current to the perceived threat "that I have to think it's a specialized adaptation that's evolved in response to predation. We just don't know what that predation is at this point."